A mesa is an elevated section of land with flat top and can be found in various countries around the world. Grand Mesa in Colorado, USA, is the largest mesa in the world. A mesa is a geographical feature characterized by an elevated section of land with a flat top, whose sides form cliffs or gentle slopes. The elevated land can rise for thousands of feet above the surrounding area to form what is referred to as table mountain or table hill. The term “mesa” is a Spanish word which means “table” in English. Mesas typically exist in arid environments and can be found in the western United States, South Africa, Spain, and Australia. Grand Mesa, a flat-topped mountain in Colorado, is the largest mesa is the world. A mesa is usually formed when a horizontal stratification of rock is pushed upwards by tectonic forces. Erosion and weathering then act on these rocks, and the weaker layers of rocks are eroded away, leaving behind the more resistant rocks which become elevated above their surroundings in a process known as differential erosion. These erosion resistant rocks form the distinct flat-top that characterize a mesa. Some common rocks which make up a mesa are basalt, sandstone, chert, conglomerate, lava flows, and spills. All of these types of rock are highly resistant to weathering and erosion. The mesa formation process is very lengthy, and can take several million years. The variation in rock types during the formation of a mesa also affects the steepness of the sides of the mountain. More resistant rock layers form cliffs, while less resistant rock types form gentle slopes. Basal sapping eventually causes the cliffs to be cut off from the mesa. Grand Mesa is the largest mesa in the world, covering an estimated area of 500 square miles and stretching for about 40 miles. The flat-topped mountain is located in western Colorado, United States, near the Gunnison and Colorado Rivers. Grand Mesa rises an estimated 6,000 feet above the surrounding region. While the top of the mountain is distinctly flat, although in some parts the mountain’s top has a rugged terrain. The top of the mesa is covered in snow, which is more profound in winter. The immense mesa has about 300 lakes and reservoirs on its top, and is drained by Kannah Creek in its western part and the Plateau Creek in its northern part. Geologists believe that Grand Mesa was formed about 10 million years ago through suppressed erosion and basalt flows since the mountain’s top is composed of hard volcanic basalt. Beneath the basalt surface lies a layer of Eocene shale and further beneath lies a mesaverde group layer. 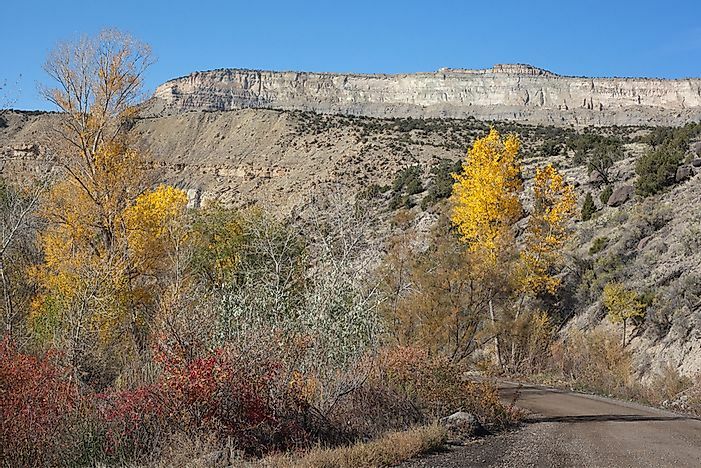 The lowest layers of the mesa are composed of Mancos shale, which acts as an important soil base and is suitable for agricultural activities. Mesas are not exclusive to planet Earth, as these geographic features have been found in extraterrestrial locations, such as Mars. The planet is known for its geological activity and is home to many interesting geographical features, which include huge mountains. Images of Mars taken from space missions and telescopes show the presence of mesas on the planet. These mesas are found in a transitional region of the planet, between less cratered lowlands and highlands, which have many craters, known as the fretted terrain. Mesas are also found on Mars in Noctis Labyrinthus. Scientists believe these extra-terrestrial mesas were formed through mass wasting processes facilitated by ice.